For those who’ve watched it, you probably noticed that the section with the Quarrymen was filmed in our very own Church Hall, the place where John met Paul and the Lennon-McCartney partnership was born! Now that the documentary has aired, we’re allowed to share some behind-the-scenes snapshots of the filming taking place. We are absolutely delighted to announce that St Peter’s Church has been shortlisted in the Hidden Gem category for this year’s Liverpool Tourism Awards! Over 400 nominations were received and, from these, an independent panel of judges selected nine for the shortlist. To have been chosen is such an honour for the Church, and we are all thrilled and humbled to be listed alongside other wonderful places in Merseyside. The winner is decided by a People’s Vote, and we would be privileged and grateful if you could vote for us if you think St Peter’s Church is the Hidden Gem of Merseyside! Click this link: https://www.liverpoollep.org/awards-landing-page/hidden-gem/ to vote! We are absolutely delighted to welcome Ellie Fearn to the St Peter’s History and Heritage team of volunteers! As well as helping out in the Church Hall on occasion, Ellie will be working on our social media and online presence. It means that ‘building’ will soon start on the many webpages that are still under construction, and we may be venturing into other social media platforms, such as Instagram. It’s an exciting time for us, and we are so grateful to Ellie for her help. It’s only the first day and we’re already in awe of her enthusiasm and ideas! Thanks, Ellie! We all look forward to working with you! 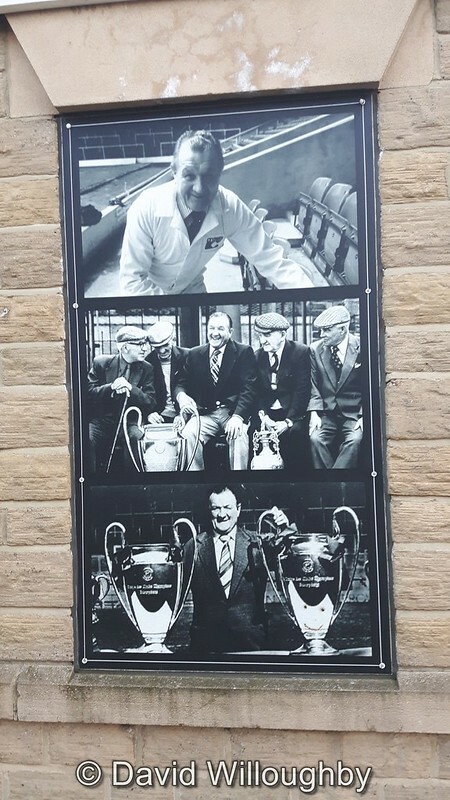 This morning we started our celebration of the 100th anniversary of Bob Paisley’s birth with photos of the memorial to him in the town where he was born. 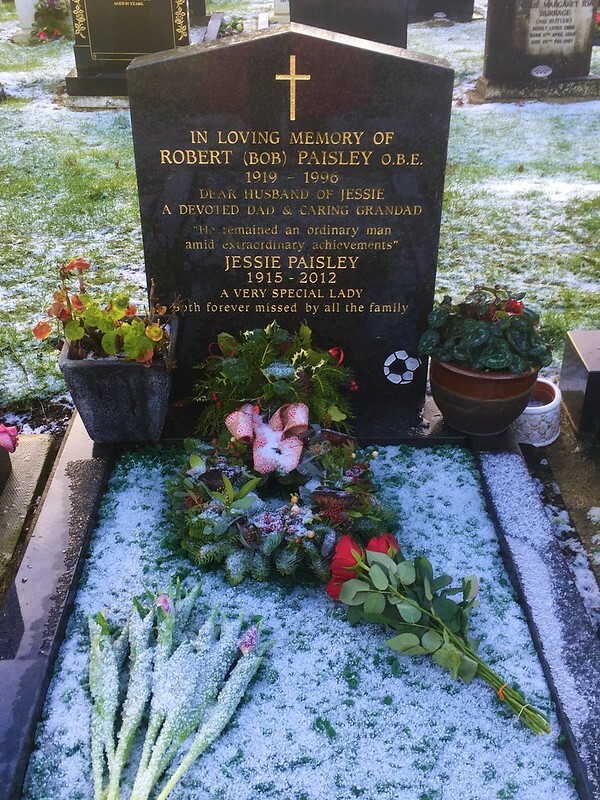 As the sun goes down, it seems appropriate to share these: photos of Bob Paisley’s grave, at St Peter’s Church Woolton. 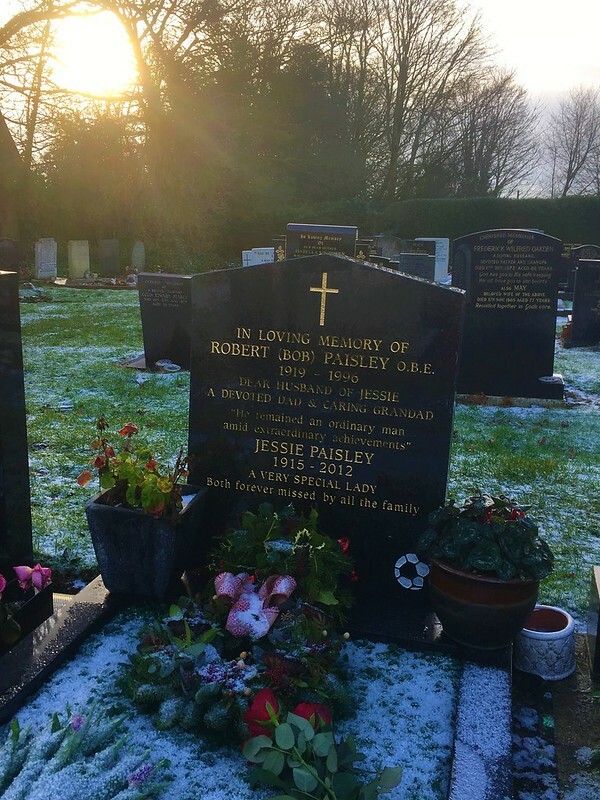 The rays of the setting sun touching Bob Paisley’s grave on his 100th birthday. We at St Peter’s are so proud of this “ordinary man” and all of his “extraordinary achievements.” Our love and thoughts are with the Paisley family on this special day. They will never walk alone. 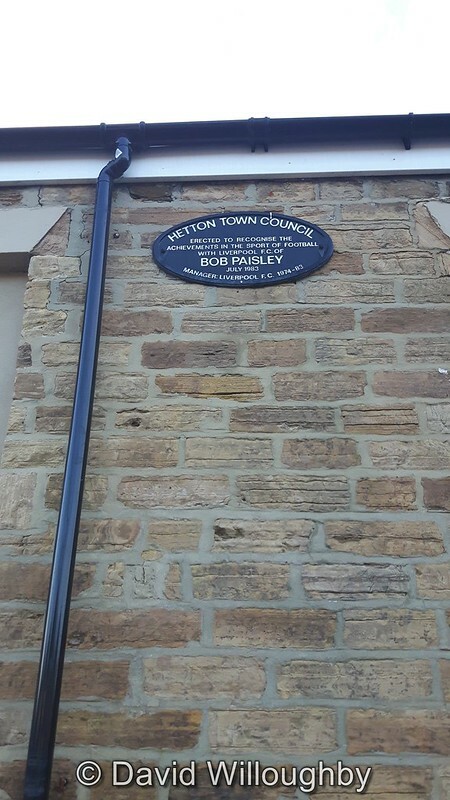 Today we celebrate the 100th anniversary of the day that Bob Paisley was born in Hetton-Le-Hole, County Durham. Bob Paisley, OBE, is widely regarded as one of the greatest football managers of all time. We certainly think so! During his nine years as Manager of Liverpool FC he won 3 European Cups, 6 First Division titles, 3 League Cups, 6 Charity Shields, 1 UEFA Cup and 1 UEFA Supercup. He won the Football Manager of the Year award six times (1975-76, 1976-77, 1978-79, 1979-80, 1981-82, 1982-83), was awarded the OBE in 1983 and was an inaugural inductee into the English Football Hall of Fame in 2002. Over the next year, our website will be updated with more details of Bob’s fabulous career, but today, we thought it was fitting to share these photos with you. They were sent to us by David Willoughby, and show that Bob is still remembered, and loved, in the place where he was born. The photos are reproduced here with David’s kind permission. Peter Moore, CEO, shared this tweet earlier! Pictured with Peter Moore is our very own Graham Paisley, Bob’s son and our verger! We are so proud of all the Paisleys today! 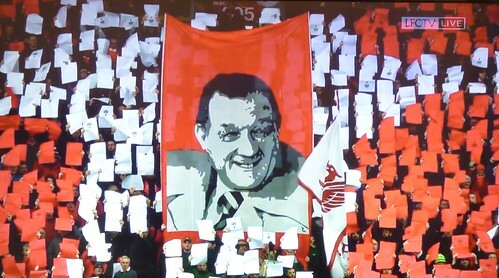 A wonderful tribute at Anfield today (January 19) to celebrate the 100th anniversary of Bob Paisley’s birth on January 23, 1919. We at St Peter’s are delighted and proud that Liverpool Football Club will be honouring the 100th birthday of Bob Paisley (on January 23) at the match against Crystal Palace tomorrow. If you are going, we’d love to see your photos! 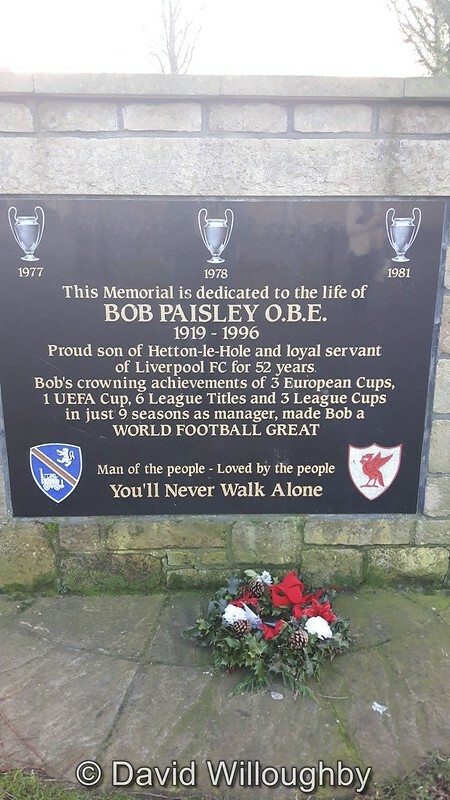 We will also be honouring Bob throughout the year with special displays in the Church and Church Hall, and via our social media. If any of our followers would be willing to allow us to use your photos or memories of Bob (with full and appropriate credit) in our tributes, please send them in a PM. Thanks in advance! St Peter’s Church is proud, and privileged, with its ongoing close association with the Paisley family. We know they will never walk alone.